Those who govern the republics of the Russian Federation are usually termed “presidents”. Last year, though, Chechnya's eccentric leader declared that only the head of the Federation itself should have the right to that title. “A country should have only one president,” he announced, never one to lose a chance to display his loyalty to the Kremlin. He thus suggested that leaders of a republic or region within the Russian Federation, including himself, simply be called heads of the republic. He immediately forbade anyone to call him “president”, and Chechnya's devoted parliament promptly coined for him the title of “Head of Chechnya”. Kadyrov's idea is only apparently weird. In fact, the iron-fisted Chechen leader has been long trying to be more than a simple president. He is trying to build the image of a political, religious, moral, and economic genius, able to lead not only the Chechen people, but also the entire northern Caucasus. Ramzan Kadyrov is 34. Before coming to power, he managed to graduate from high school in his native Tsentoroy, formerly a small, virtually unknown village on the slopes of the mountains. Over the last ten years, the village has turned into an impregnable fortress with luxury palaces, checkpoints around the entire perimeter, and continually guarded by loyal followers. Kadyrov's political career has been accompanied by many titles and honours, but also academic achievements. The young governor can currently boast two degrees, a PhD in economics, and professor status. Only few years ago, to Anna Politkovskaya's question, Kadyrov answered he graduated from a branch of one of Moscow's universities, but he could not add in what subject. Nowadays, he would be unlikely to be caught in a similar impasse, since his press service strictly “screens” questions with journalists. Ramzan Kadyrov became prime minister and then president after the death of his father, Akhmad, a well-known theologian who, at the beginning of the first Chechen war, had invited the entire population to wage a holy war against Moscow. Kadyrov senior was also famous for stating that, in order to end the war, each Chechen simply needed to kill 150 Russians – clearly referring to the fact that there are 150 as many Russians as there are Chechens. He also fought, although no one knows how many Russians he managed to kill before going over to their side. At the time, 18-year-old Ramzan was always at this father's side. Today, his biographers love to tell the tale of young Kadyrov, machinegun in hand, defending the homeland from Russian invaders – apparently trying to cast him as devoted soldier and patriot, ready to fight and die for Chechnya. However, the only evidence of his participation in war are some photographs of young Kadyrov, in civilian dress, trying to get into a picture with the leading Chechen commanders of the time, who Kadyrov senior and junior later joined the Russians to fight against. The first war ended in August 1996 with the victory of the Chechen rebels. Over 100,000 Russian soldiers were forced to leave Chechnya. The Kremlin, then led by Boris Yeltsin, signed a treaty of peace and collaboration, where both sides committed to solve every future controversy by peaceful means. Not even three years later, however, events supported Winston Churchill's claim: “A treaty with Russia is not worth the paper it is written on.” Russian troops again invaded Chechnya, then torn by political conflicts, criminal feuds, and economic disaster. Kadyrov senior, who had once invited the population to fight Russians to the last drop of blood, suddenly changed his mind and joined the Kremlin's side. He soon became president and appointed his son head of security. Even then, journalists and human rights activists wrote extensively of the private prisons and the torturing of rebels and suspected civilian sympathisers. Later, these rumours became an integral part of Ramzan Kadyrov's image, but Russian authorities have kept supporting him. His throne has never teetered, not even when his critics or opponents were killed inside and outside Chechnya. The list includes journalists (Anna Politkovskaya), human rights activists (Natalya Estemirova), “Heroes of Russia” (the Yamadayev brothers), and torture victims that managed to escape the secret prisons (Umar Israilov). They were murdered in Grozny, Moscow, Dubai, Vienna, but none of these cases was solved. In every case, the Russian authorities and Kadyrov blamed hypothetical enemies of Russia that aim to discredit the Chechen leader. After proclaiming, many years ago, “no wounds of war in Chechnya”, Kadyrov and his team rapidly rebuilt the capital. Many schools and social facilities were renovated, especially downtown Grozny; apartment complexes were built; much attention was paid to schools and kindergartens run by one of Kadyrov's sisters. There, children learn very soon that thanks to Kadyrov's genius, Chechnya lives in peace and harmony, and that they should try to be just like him. 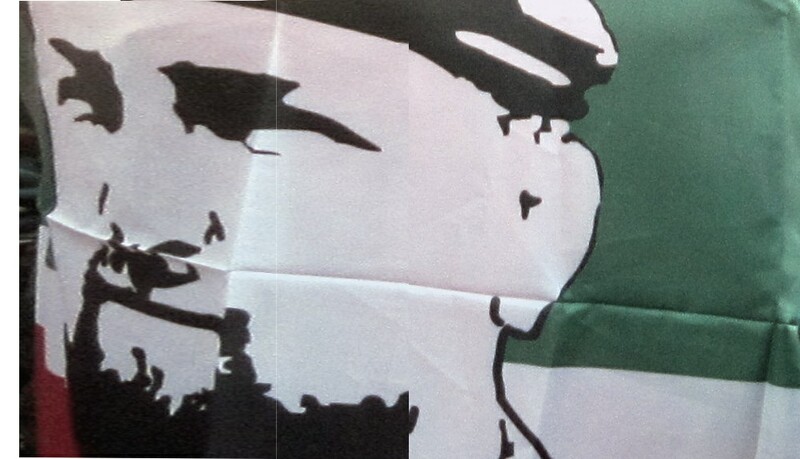 To this end, the organisation “Kadyrov's Youth” was created on the model of the Soviet “October's Youth” – except their silk ties are green instead of red, and their songs hail Kadyrov instead of Lenin. Despite the massive changes in the urban landscape, most Chechens still live in moral and material misery. Even official figures estimate unemployment at over 40%, although unofficial ones draw an even gloomier picture. Most jobs are only offered after paying a bribe. Many live on extremely low pensions or unemployment support. Some leave the country to find shelter in Europe, and those who cannot leave fear the many squads in charge of repressing dissidence and discontent. The facades of most Chechen buildings are covered with huge portraits of the young leader, his father, his mother, his brother, and other family members. The television news starts and ends with reports of Kadyrov's achievements. Newspaper headlines swarm with his conquests. His fan clubs are scattered across the capital. Cars sporting his picture cross the streets of the rebuilt capital. Some have license plates reading KRA, short for Kadyrov – those who drive them belong to his tightest circle, and no soldier would dare stop them. Kadyrov himself, virtually catapulted from childhood to power, is no longer the slouching young man who once showed up in a blue gym suit to visit Putin at the Kremlin. He now looks powerful and confident – a “father of the nation”, as his acolytes obsequiously define him. He organises matches with global soccer stars . As president of the local soccer team, Terek Grozny, he hired former Dutch champion Ruud Gullit as a coach . As president of the Ramzan boxing club, he brought Mike Tyson to Chechnya . As admirer of Italian fashion, he organised fashion shows with Italian designer Roberto Cavalli . Kadyrov forbids Chechen women to go to work without a headscarf or in short sleeves. On festive days, he prescribes men to wear the national costume, not worn since the 19th century. He himself, lately, has preferred tight, high-necked uniforms styled after Stalin or Mao Zedong . According to rumours, they are custom-made by the best tailors of the Brioni fashion house. In his 34 years, Ramzan Kadyrov reached heights not even dreamed of by his peers in Chechnya. Despite the long trail of suspected tortures and murders, it would seem that, as long as the Putin-Medvedev tandem is in power, Kadyrov has much more than a second term in his pocket. According to many analysts, such unusual benevolence can be explained because a part of the billions destined to post-war reconstruction of Chechnya ends up in the hands of high officials in Moscow. The future will probably not bring more transparency into the paths of Russian federal funds. However, a new initiative, announced by Kadyrov in the first day of his second term, let us think these funds will be growing soon. A ski resort will be built in the Chechen mountains for extreme sports lovers from Russia and Europe. The project will cost 14 billion roubles (around 350 million Euros). As is well known, Kadyrov's patron, Vladimir Putin, is a ski lover. Will he leave favourite Sochi for the adventurous canyon of Argun, where there are already many extremists, but no extreme sports lovers yet?